A look back at what was happening around here in July 2005. 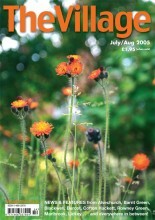 The cover of our combined July/August 2005 issue showed vibrant orange hawkweed growing by a village road. The search for land for allotments in Alvechurch had spurred Bromsgrove District Council into action, with Coun Roger Hollingworth looking into the possibility of the council buying land which could be leased to villagers. Meanwhile, Cure Leukaemia was asking Village readers to sign up for a sponsored walk in the Lickey Hills, raising funds for the charity. * 254 pupils from Crown Meadow First School in Alvechurch brave a downpour to take part in a world record attempt for the largest “walking bus”. Children from across the UK were involved in the simultaneous event, raising money for road safety charity Brake. 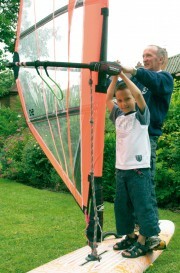 * Barnt Green Sailing Club’s Commodore Merlyn Wilcox shows youngster Reece Daley how to use a sailboard at Barnt Green’s summer festival, which brought residents and traders together for a fun afternoon of entertainment, stalls and displays in the village centre.